Chrome version 23 and later on Windows 8 now only supports Metro or Desktop mode, not both at the same time. The Click&Clean version 7.9 are built using a technology called NPAPI and is compatible with Windows 8 Desktop mode only. Click on the Chrome menu button at the right of the address bar. Select Relaunch Chrome in Desktop mode, then all your open tabs will now relaunch in Windows 8 Desktop mode. 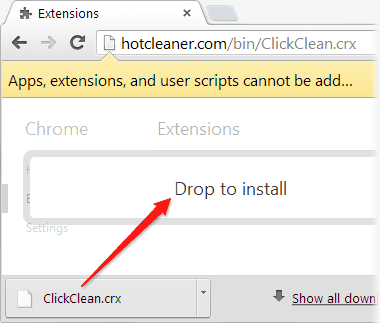 When the download has completed just drag the ClickClean.crx onto the Extensions tab (Pic.1), then wait sveral seconds and click on Add button when asked.